The Batman movie is happening. While official details remain limited, there's plenty of rumors to keep us going: it's reportedly arriving in a year and a half, will feature oodles of baddies, and plans to be a proper detective story. It's also expected that alongside Ben Affleck's brooding crusader will be JK Simmons' Commissioner Gordon. 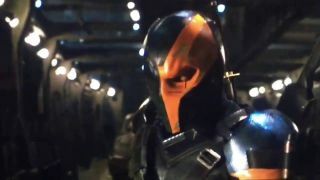 There's got to be a bad guy - c'mon, this is a superhero movie - which is where Joe Manganiello's Deathstroke comes in. The villain got his own special teaser earlier this year, and the actor has now revealed a little of what we can expect from his portrayal. "When I met Ben we sat down and we talked about, you know, the role. We talked about the movie. His take is a fresh take but I think the audience is going to be surprised. Because it’s a road that no one’s really gone down that’s completely integral to, you know, who Batman is," Manganiello said on Mark Madden's podcast. "I think it’s gonna be refreshing but at the same time completely familiar. But it’s going to take this franchise in a direction that I think A LOT of people are going to be really happy about. It’s going to be gritty and action packed and cerebral and all of those elements that people love about Batman." "Ben’s a great director, man. I mean the last movie that man directed won best picture. He’s got an Oscar for writing. Like, this is all the components to go down as a… everything is lined up for a really really really great movie. Not only a superhero movie but just a great great movie."